On July 4, Ambassador Liu Xiaoming met at the Chinese Embassy with Sir Edward Lister, Non-Executive Director at the Foreign & Commonwealth Office, and exchanged views with him on the construction of diplomatic premises of China and the UK. Ambassador Liu spoke highly of Lister’s effort in the cooperation between China and the UK on diplomatic premises, noting that China’s new home in the UK is one of the most important projects of Chinese diplomatic premises and a significant symbol of China-UK “Golden Era”. Currently, China-UK relations enjoy a sound momentum. He hoped that the two sides would support each other and strengthen cooperation in the construction of diplomatic premises so as to achieve win-win result. Lister once again extended his congratulations on China’s purchase of the new diplomatic premises, saying that the transaction fully demonstrated the importance of China-UK relations, which is of great significance to promoting the relations between the two countries. 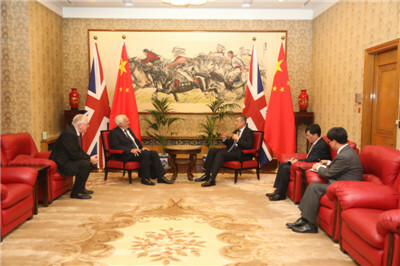 The UK’s embassy renovation and expansion project in Beijing is underway and he hoped to have China’s support and assistance. The Ambassador said that China is willing to join hands with the UK to ensure the smooth progress of the new diplomatic premises projects in both countries, making them milestones in China-UK relations in the “New Era”.